Palestinian poet Ashraf Fayadh is in a Saudi prison, allegedly for spreading atheism – and having long hair. The poet, raised in Saudi Arabia, was arrested five months ago, when a reader submitted a complaint against him saying that his poems contain atheist ideas. The accusations were not proven and he was released, only to be arrested again on the 1 January 2014. Fayadh's case is making the rounds in media and on social networks, with condemnations coming from Arab writers from across the region. Some of his friends wrote online that the real reason behind his arrest might be due to the video he filmed five months ago of Abha's religious police lashing a young man in public. Currently, the poet is still in jail with no evidence to the accusation or details of a coming trial. The following reactions clarify his case and express condemnations from Saudi writers, artists, and others standing in solidarity. @reem_tayeb: Ashraf Fayadh is accused of ‘harrasing the Godly self and letting his hair grow long.. when these laughable-sad accusations stop, we can start talking about rights and freedoms. @MohammdaLahamdl: Ashraf Fayadh's arrest is an announcement that we have reached what Europe faced in the Dark Ages. @WhiteTulip01: Do you think your faith is real when you think God can be harassed!! @MusabUK: Ashraf Fayadh is detained for atheism. Is atheism a charge? Is faith enforceable? That's if we assume the charge is true. @b_khlil: The fact that Ashraf Fayadh is now detained with criminals and killers just because he is a poet, tells us that justice is only a privilege to us, both as people and the regime. @turkiaz: The poet and artist Ashraf Fayadh is imprisoned for 15 charges, including atheism and long hair. Why? Because he filmed the religious police as they were lashing a young man in public. @AhmedMater: To our media: should we wait? Some professionalism would do. 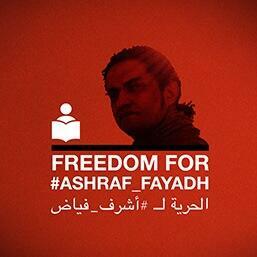 Ashraf Fayadh's case is going to be on the front pages of international media soon. to the jail they cry, lock him up they scream in fear! we have a poet in our midst! why does just a few grams of justice freedom revolution trouble them?